South Africa is a beautiful country and I would never get tired of visiting this country again and explore the different tourist spots in South Africa. 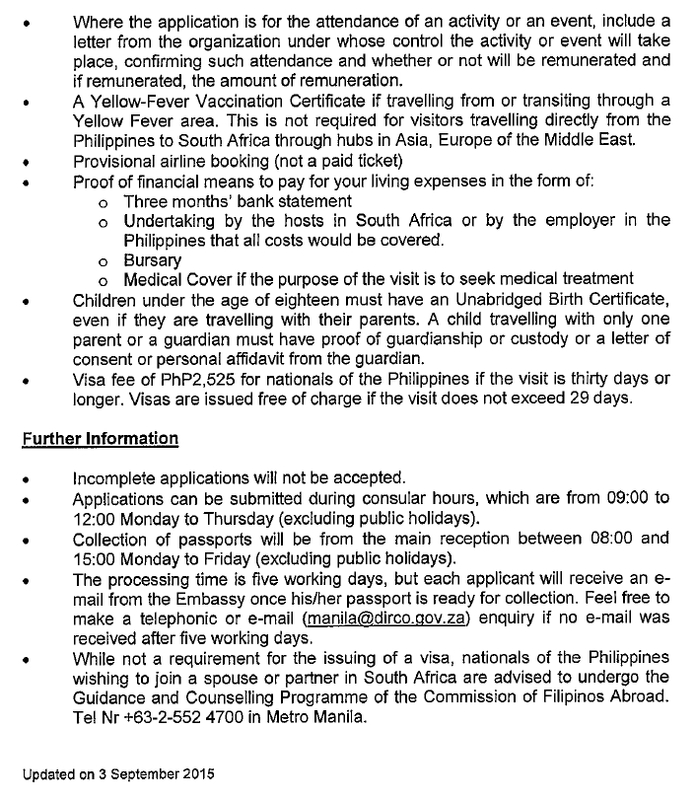 For Philippine Passport holders / Filipinos, please be informed that they updated their requirements for the tourist or visitor’s visa to South Africa as of September 3, 2015. Very informative information for Philipinos whom going to travel to south africa..
thanks for the info. this is such a thrilling adventure for u for sure. Pleasure always Lee! Getting a visa I think was more adventurous! But in the end South Africa is a beautiful country! Thanks for sharing this information, once we have plan to visit south africa I will surely re-visited this site and I will save in my favorites. Thank you so much! I would suggest apply 2 months before your flight and be very patient as getting visa could be hectic. But once you are in South Africa, it's worth everything! Thank you so much! The moment I got these info I can't wait to post them and help others who are wanting to know the requirements. It saves a lot of time too. Thank you for putting this list together. It's very helpful and informative, especially for fellow Filipinos planning to travel to South Africa. I heard South Africa's a beautiful country with lots of adventures to do. That is so true Russ. I really want to share this information to all the Fiipinos who want's to go there as a tourist and also going on a transit from South Africa to other African countries like Lesotho. THey will never run out of adventure and it's so different from Asia and that I enjoyed a lot! Happy New Year Russ! We're not planning to visit South Africa for now as we plan to explore Asian countries first. But definitely these details on the list are helpful. Wow! Love to visit this place, what hinders me now is that my kids are still young. But this list will probably help me prepare things needed for my travel soon. 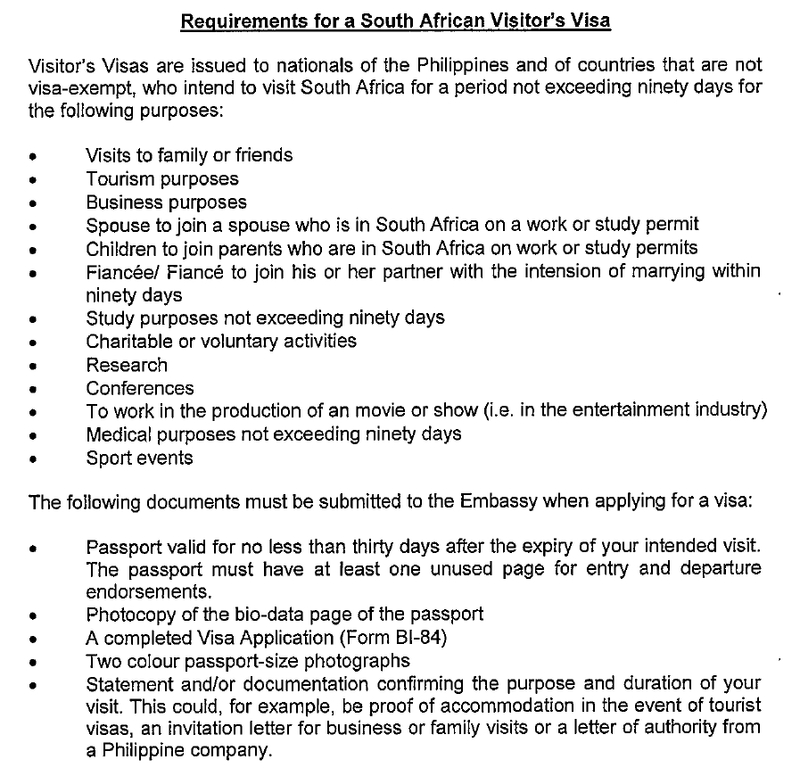 A very detailed info, thanks for providing them, very helpful for Pinoys planning to explore South Africa. An Asian tour is on my list pa eh. Pleasure always! Thank you too! Why do you say it is affordable to travel to South Africa? What airline goes there from Manila? I hope I can go there with my wife one day. Hi Fred, Cathay Pacific offers the cheapest rates Johannesburg. December is the best time to come since its their summer time. Oh, before the exchange rate was 7pesos to a 1 Rand. Now it is 4Pesos. So when you convert things to pesos in South Africa, they are almost the same price here in the Philippines. Specially the food! 🙂 Happy New Year Fred! Thanks for the infos and tips. South Africa is an awesome place. I wish I can go there in the near future. That is so true! You will love South African in so many ways! Happy New year! Thanks for the information. Have a good 2015 ahead! Thank you and it's always a pleasure! Great informative post here. Bet all your countrymen will find it useful. I plan to consider your tips before going to South Africa. You offer a detailed list and providing all the necessary documents is a must. Happy New 2015! Wish you many new journeys! 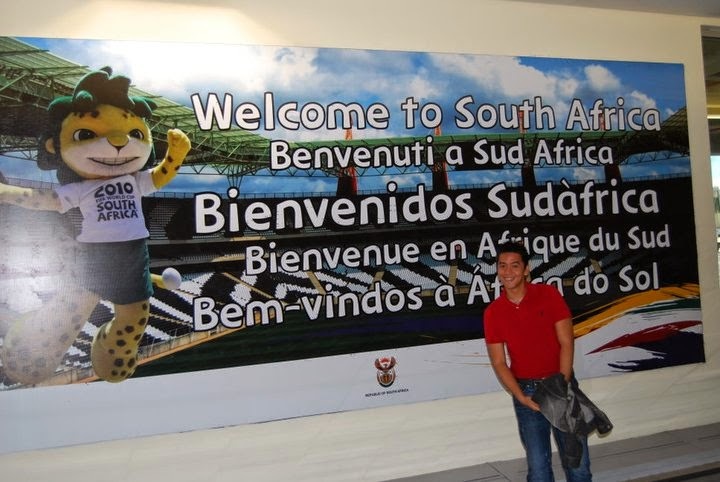 This is a very helpful and informative post for those who are planning to go to South Africa. I want to go there as well when I saw that Metro Magazine had their shoot there. It looks like a very adventurous place to visit. I'm always amazed when I see that some countries want proof of bank statements… I guess they want to be sure people will go home. Great tips. Thanks for the post! Do you have any idea how to get 9g visa? You have to go to South Africa! It's a beautiful country and rich culturally! South Africa is really beautiful especially the safari. It would really be nice to visit the country. South Africa is one of those in my bucket list. Thanks for sharing this information. Useful information! I would really love to see South Africa with my boys one day! Hi there is no show money involved, do you have a sponsor? If not just provide them a certified copy of your bank statement. I am not sure but once they approve your visa, they may ask you for a bond of Php 30k but you can have it back when you return to the Philippines. Madaming dahilan for the the visa not to be approved but only they can tell. Hi so the 30k bond only implies if you do not have a sponsor? Yes you have to submit everything to the consular office sa RCBC. No interview needed and if they needed more docs, they will let you know and request for it. For new applicants for tourists, they may ask for a 30K bond. When you arrived back, you will have to go back sa SA Embassy to request for the money which you get it after a few days either by bank transfer or personal. Good luck on your application! Good luck on your application Harold. Let me know how it goes ok?